Hi peoples, there is going to be a talent show next week, leaders will be competing (especially the Brian-ator). There will be a prize for the winners and runners up, losers will be left in a hole to starve. If props, sound effects or music are required please provide them yourself. Edit: Groups are allowed, no more than 4 to a group, performances must be more than 5 minutes for each group/individual. 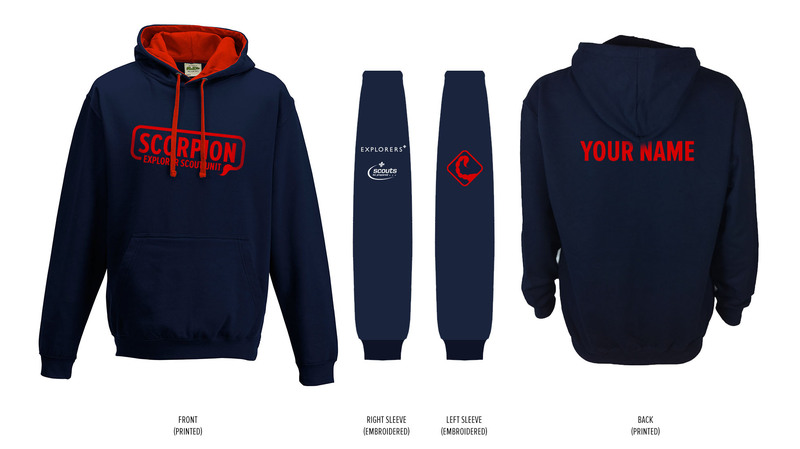 As most of you saw last week we have a new hoodie design (design below), if you would like one please print off the order form below, fill it in and bring it with payment (£27) tonight. We need at least 9 orders before we can do our first run. The Wanger society once again win the Rock trophy at the Chase Walk this year, that makes 9 years on the trot. Congratulations to Angus, Adam Blood, Andrew and Ezra. Our other team did exceptionally well too with a stellar time of 14 hours 6 minutes. Well done to Eli, Billy, Jess Mac and Dave. You should all be very proud of yourselves. The badges you all received can be attached to your uniforms, they should go above the world scout association member badge (the purple round one). Well done, all of the leaders are very proud of what you have managed to achieve once again. As I said on Tuesday I will be arriving at camp somewhere around 15:00, it is in your best interest to get there as early as possible so you can put your tents up in daylight. See you at Beaudesert tomorrow! Please bring all kit tonight except food, that includes boots, hats, gloves, compasses (if you need one we have some for sale, please bring £5 if you need one), whistles EVERYTHING. Please check the kit you will need as a team too, as you are responsible for that too. Also please bring with you a completed health form (Chase Walk Health Form 2015). Tomorrow morning will be our final practice walk. Please meet at the windmill pub in Meir Heath at 7:15 am. Everyone must be there with full kit please. If you have not paid for the Chase walk yet please bring your £22 tomorrow too. As you know we are ice skating tomorrow night, please meet at Cinebowl iSkate (http://www.cinebowl-iskate.co.uk) at 19:45 – PLEASE NOTE THE CHANGE OF TIME. We will begin skating at 20:00 and finish at 21:30.